Piso Fare 2019 Promos Until 2020: Php 699 is the cheapest fare now! Php 699 is the cheapest fare now! Piso Fare Promo 2017: Ooops! Sorry if you are still waiting for a piso fare until now, but there's none yet! 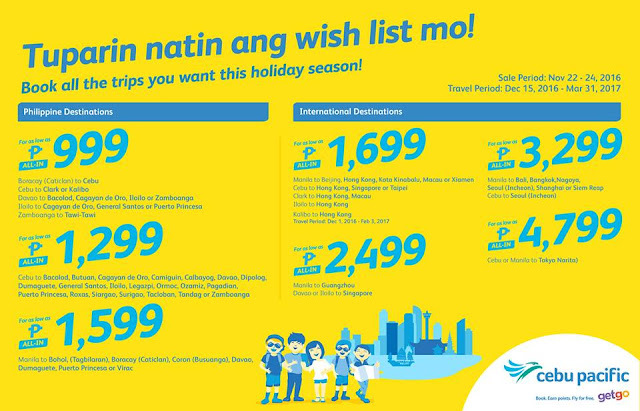 However, you can take advantage of the cheapest fare currently launched by Cebu Pacific. The cheapest you can get is Php 699 and that is enroute to Cebu coming from Kalibo or Clark. So definitely, you can check the Queen City of the South and enjoy a lot of it's concrete jungle view and an ample of tasty delicious Visayan cuisines especially the best crispy lechon (roasted pig). And a double treat to all Cebuanos, you can choose to visit Bacolod, Boracay (via Caticlan), Butuan, Cagayan de Oro, Camiguin, Calbayog, Davao, Dipolog, Dumaguete, General Santos, Iloilo, Legazpi, Ormoc, Ozamiz, Pagadian, Puerto Princesa, Roxas, Siargao, Surigao, Tacloban, Tandag or Zamboanga for a very affordable all-in fare of Php 1299. For international flights, there are select destinations and key cities of Asia that are on promo like Tokyo, Singapore, Hong Kong, Bali, Phuket and a lot more. The best thing you can do now is head to Cebu Pacific's website and browse for available seats for your 2017 international vacation. You can go backpack solo or with your love ones or friends or colleagues at work. Quoted fares are valid for one-way travel only, inclusive of 7kg hand carry baggage allowance, base fare, web admin fee and taxes collected at point-of-sale. Domestic Terminal fees for non-Manila/Caticlan/Cebu stations and International Terminals Fees for non-Manila stations, plus Php 1,620 International Travel Tax must be paid at the airport. Promo fares have limited availability and are non-refundable but rebookable subject to the following rebooking fees: Php 1,500 for domestic destinations, Php 2,300 for short-haul international destinations and Php 2,800 for long-haul international destinations plus fare difference. For your convenience, flight changes, availing of prepaid baggage allowance for check-in baggage and self-check-in services can be done up to four hours before scheduled flight. For inquiries, call (02) 70-20-888 in Manila or (32) 230-8888 in Cebu or visit the travel agent near you. 2017: Popular Destinations Flights Boosted!